Colt Police Positive in .32 Colt with "Angel Wing" Folding Knife by Gene Osborn. This is a Colt Police Positive .32 Colt Target Model, nickle plated, in 95 to 98% original condition with a six inch barrel, windage adjustable rear sight, elevation adjustable front sight, and original Colt mother of pearl grips. The backstrap, trigger and hammer are all neatly checkered. The folding knife was crafted by artisan Gene Osborn of Center Cross Cutlery (www.centercross.com) and features an ATS-34 Hollow ground stainless steel blade on an extended tang lockback folder with mother of pearl handles, red expansion spacers and bronze damascus bolsters. The folder is fully fileworked and the titanium liners are multi colored. 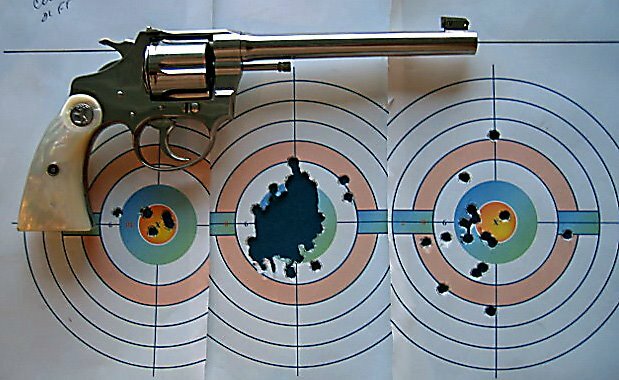 Left to Right: Six rounds was fired at the first target which was set at 21 feet. The second target was also set at 21 feet and absorbed 44 rounds. The last target was set at 40 feet and fired at with 16 rounds. 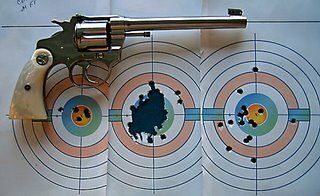 This Colt Police Positive is really a beautiful revolver and the Mother of Pearl grips are magnificent with streaks of red and blue visible when they catch the light. There is not a scratch, ding or piece flaking off. There is actually a swell in the center of the grips which had to have been difficult to execute by whoever fashioned these grips at Colt. Mother of Pearl just isn't that stable of a material and flakes, chips, and splinters quite easily. The grips were filling enough that I was not tempted to add a Tyler T-grip adapter to them as I have on most of my vintage revolvers. This revolver also had a beautiful trigger pull and begged to be fired double action. The DA pull was easy to stage (credit to Mike D. for teaching me that) and actually gave better accuracy in Double Action shooting than when firing Single Action. All shooting was done with Mag Tech 98 grain semi-jacketed hollow point ammunition. 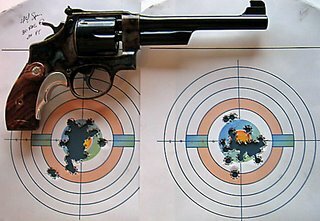 If Colt would go back to making revolvers with the same attention to detail and overall quality they would be in great demand. 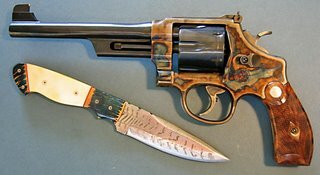 Smith & Wesson Heritage Revolver in .44 Special and "Devine Spirit" hunting knife by Gene Osborn. The Smith & Wesson Heritage Series revolvers were made in the late 1990's and although some were exact copies of vintage S&W revolvers, this one is more of a blending of some of their older handguns. The .44 Special features a case colored frame with a blued barrel. The rear sight is adjustable for windage and elevation and the front sight is of the target variety with a gold bead. The gold bead picks up whatever light is available and this was the best sighting arrangement "back in the day' before fiber optic, glow-in-the dark, red dots and laser sighting systems. When I first saw the Smith & Wesson Heritage series advertised I wanted one, but never saw one in a gun shop. When the series was discontinued I gave up looking for one. As luck would have it, I just happened to be at a local gun shop right after someone brought a seemingly unfired specimen in to trade. It had not even been tagged for sale when I slammed down a layaway payment. The "Devine Spirit" hunting knife is another Gene Osborn creation and has gold-lip mother of pearl handles with red expansion spacers, Gene's own bronze cable Damacus bolsters (both front and rear), and a three billet composite cable damascus blade with opposite twists forged by Gene himself. The blade also has a false edge on top and filework on spine The Damascus is certainly unlike any I have ever seen, it almost looks antique. You will be hard pressed to find this Damascus steel in any other knife. The moniker "Devine Spirit" is the name I gave to this knife, not Gene. I call it "Devine Spirit" as a Japanese reference to the workmanship Gene has demonstrated in this knife. You see, the Japanese believe that a master bladesmith can put his spirit into the blade. They speak of the concept of a "live" blade. To many westerners who do not understand, they think that "live" merely means sharp. While it is sharp, "live", to the Japanese, it also infers that the spirit in the blade makes the blade alive and when the owner felt this he was bound by tradition to only use the blade in accordance with their code of honor. Two targets fired at 21 feet using Mag Tech 240 grain cartridges. Target on the left was fired at 40 feet, target on the right was set at 50 feet. Both targets where shot with CCI Blazer 246 grain Gold Dot Hollow Point ammunition. The Smith & Wesson Heritage model is another great shooter. The area between the front strap and the trigger guard was a little too wide so I added a Tyler T-grips adapter to assist the handling of this great looking revolver. 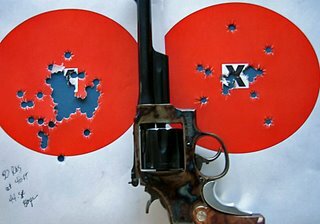 The Single Action Trigger pull was extremely light. 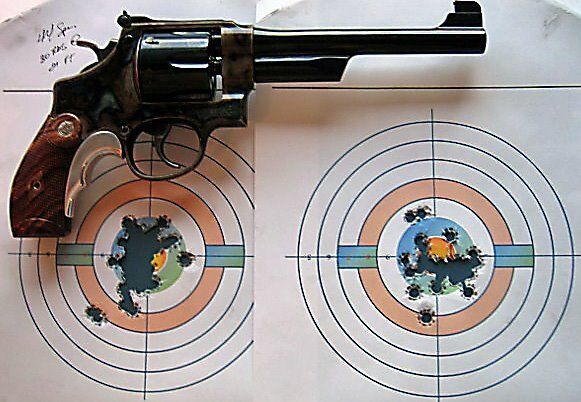 Having an accidental discharge would be quite easy and really brought home the importance of always keeping the barrel pointed downrange and keeping your finger off of the trigger until ready to fire. The good new was that the double action pull was very good and not a hinderance to accurate shooting. Another good lesson is to always check your ammunition closely. The night before this range session I stopped and picked up two boxes of .44 Special; a box of Mag Tech and a Box of Winchester 240 grain target loads. At the range when I got to the Winchester ammo I placed them into the cylinder and it would not shut. I realized that just a little bit of the cartride was not going into the cylinder chambers. Upon closer inspection the ammunition was .44 Magnum, rather than .44 Special. Checking the box again it was clearly marked .44 Special. I am very thankful that I did not try to force the cylinder closed while it contained the magnum ammunition. Smith & Wesson no longer makes the Heritage series of revolvers and I feel very fortunate to have found one.